You are here: Home » Nutrition Month: Do you struggle with meal preparation? It’s mid-March and Dietitians of Canada’s National Nutrition Month continues. This year’s theme, Best Food Forward: Plan Shop Cook Enjoy is essentially a plan on grocery shopping. After all, it is the first step in preparing enlightened eats at home. But with life in the fast lane- for example, long work hours or juggling various schedules such as after-school activities, cooking meals can sometimes fall by the wayside. Fast food eateries, take-out and convenience products may win out over preparing dishes from scratch. Then there’s the issue of shopping. According to an Ipsos Reid poll conducted for Dietitians of Canada in the spring of 2012, of the more than 2000 adults across Canada surveyed online about their grocery shopping habits, it’s evident that Canadians need help. A shocking two thirds (63%) of us struggle with making healthier food choices in the grocery store at least half the time they shop; more than one third struggle at least 75% of the time. While we may be thinking about local food and putting nutritious food on the table, we want and need it done in a flash. That’s where prepared food and convenience items come in. At the same time, we clearly want help. But the assistance we’re seeking is MIA. According to a recent survey among Canadians about sodium knowledge, attitudes, and behaviours, just published in the Canadian Journal of Cardiology, the majority of respondents favoured government-led action. Over 85 per cent support interventions for lowering sodium levels in processed foods, almost 75 per cent in restaurants and over 81 per cent in food served in public institutions. There is also a great deal of support for public education with over 80 per cent in favour. Yet while Canadians express concern and support for lower sodium choices, the supermarkets in this country are filled with some of the highest sodium offerings in the world, compared to the same products elsewhere. Preparing homemade dishes, using fresh and frozen foods, can hit two birds with one stone. For one, it makes lower sodium eating an easier task. Secondly, it tells the food industry that they had better shape up if they want consumers buying their products. Banishing sodium-laden products from your grocery cart and putting them back on the store shelf sues sends a message. Unfortunately though, there is the perception out there that there is not enough time to make a meal from scratch. But truth be told, it’s all about organization. It needs to be done occasionally and then everything is set. Consider this: How many times do you wonder about what to make for dinner right before dinnertime? If late afternoon is when you make your decisions, it’s no wonder that making a meal from scratch holds little appeal. It’s a time when energy levels often wane and coming up with ideas for quick nutritious eats can seem like an Olympian feat. Plus all too often, you’re likely missing an ingredient or two if you do have any inspirations. Instead put together a menu that you can use over a few months and change according to the seasons and what’s available or on special at the supermarket. Get more information about National Nutrition Month and also find out about the eaTipster mobile app was created by Dietitians of Canada to make it a little easier for you to eat healthy. 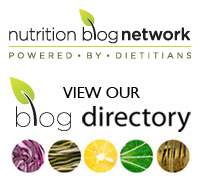 Dietitians serve up a trusted new tip for you each and every day. Do you use a menu for meal planning or do you take each day as it comes? Please share in the comment section below.